In 2011, we launched Beyond Money in which we use the term ‘funding plus’ to describe ‘any activity which is additional to a grant and the grant-making process’. This description – arrived at following over 100 interviews with funders, grantees and consultants – means that all stages of the practice of making grants, however engaged and sophisticated, fall outside the broad tent of funding plus. Most funding plus activity is described as ‘capacity building’ (training, consultancy, support) aimed at developing the skills of individual grantees and/or organisations. However, we have also found that many funders work to achieve influence and change through ‘plus’ activities, such as convening, networking or brokerage. For a small number of foundations, the distinction between ‘funding’ and ‘plus’ is consciously and deliberately blurred. We have described this practice as ‘high engagement funding’, a term that better reflects the phenomenon than ‘grants plus’ or ‘funding plus’, which imply a simple ‘add on’ to basic monetary transfers’1. This degree of engagement – where going beyond the money may be automatic and is an expression of values and beliefs – is still relatively rare. Indeed, at the other end of the spectrum, going beyond the money might just not be the right thing. And, whilst there’s no shame in that, we do encourage all funders to engage in debate and discussion about the use of their assets as part of a wider consideration of what it means to be a responsible funder. 1Cairns, B and Buckley, E. (2012) ‘New ways of giving’, Paper presented to the ISTR Conference, Siena, Italy. Be clear about purpose: To inform thinking about the focus and method of additional support, funders need to think about purpose. 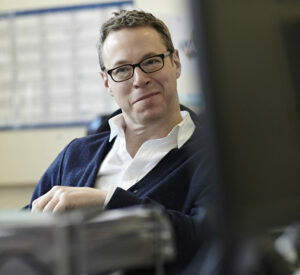 Is it to strengthen individuals, projects and organisations, or a combination of all three? Know and understand grantees work: Our research shows that funding plus works better when funders understand grantee field, context, circumstances and concerns – this helps to ensure a good fit between the organisation and the support. Alignment: Through open communications with grantees, be clear together about purpose, design and delivery (why, how, what). Establish a shared commitment to the process: Ensure grantees are ready and willing to be part of a funding plus approach. Ideally participation will be voluntary but, if it can't be, communicate expectations clearly from the beginning. Avoid prescriptive and standardised approaches: Bespoke approaches allow grantees to have ownership of support and outcomes. In a context of uncertainty and change, off-the-shelf toolkits or online solutions are likely to be of limited use. Organisations benefit most from flexible, tailored support that they can access when needed. Prioritise support for forward thinking: We have growing evidence that it may be beneficial to focus support on forward thinking and planning – mission review and renewal. Organisations that are able to adapt and develop are those which review and renew their mission in a changing environment. Those that understand their mission best are those strongly rooted – with a clear sense of where and how they fit into the greater scheme of things. Invest in the right kind of support: Smaller organisations are distinctive - support may be best carried out by people experienced in development work and with a clear understanding of their role, accountability and reporting relationship with both funder and grantee. Be mindful of power: Foundations need to pay serious attention to some of the ethical dilemmas posed by extending involvement in grantee organisations beyond the provision of funding. In particular what is your mandate? What are the limitations of your role? How best to use your power for good ? ('power to' not 'power over') How best to deploy resources and guard against seeking gratification or profile over social impact? What are the benefits of funding plus? What are the challenges of funding plus? Lack of clarity about roles and expectations: It can be hard to understand the role of the funder, especially if one person is trying to fulfil all roles (eg. manage a grant and provide support). Sometimes in our studies grantees were not clear what support was available or what was expected of them. Inappropriate interference: There is a fine line between adding value and interfering. 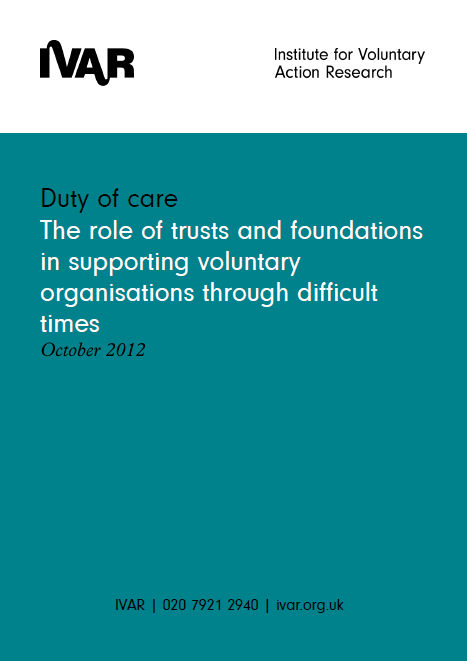 We have found that funders are sometimes seen as overstepping the mark. The need for adequate resources: Receiving support and using support takes time and requires skills. Readiness and willingness to contemplate and achieve change: Grantees need to be engaged in the support. Our research shows that problems can be emphasised when support is imposed, so the style of support and diagnostic are really important. Cultural fit and goal alignment: Achieving a cultural fit and goal alignment with grantees, partners and support providers isn’t always straightforward or possible. Time, cost and skills: Time spent building relationships and engaging with grantees may be seen as a distraction from grant-making, so trustee commitment to this way of working is essential.  Managing support: The balancing act between providing bespoke support and (easier to manage) standardised support can be difficult and needs to be handled with care. What helps & hinders funding plus? It’s not about the money money money? At a recent Association of Charitable Foundations workshop on ‘funding plus’ (aka ‘grants plus’ or ‘funder plus’) I was interested to hear one of the funders present say that they now felt relaxed about the prospect of ‘just giving grants’. Was this a case of heightened self-awareness or just a lack of creative thinking about what is possible with independent money? 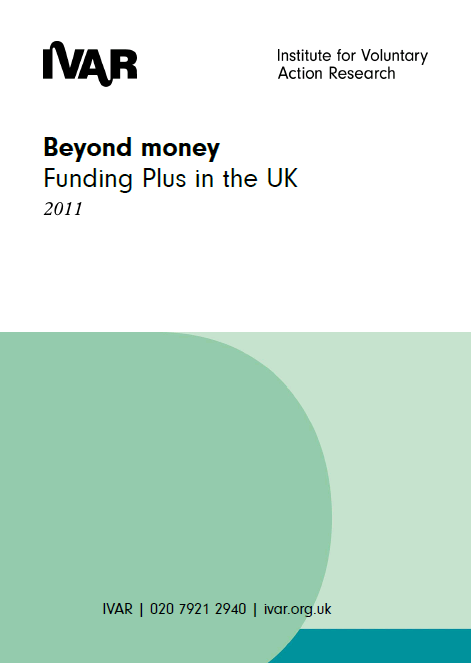 Beyond money: A study of funding plus in the UK is the final report of research funded by Barrow Cadbury Trust, The Diana, Princess of Wales Memorial Fund and Trust for London. This report outlines findings from the ‘Recession Watch' research project led by IVAR and working with: Comic Relief; Cripplegate Foundation; The Diana, Princess of Wales Memorial Fund; Esmée Fairbairn Foundation; Henry Smith Charity; and The Tudor Trust. What does sustainability mean and how does the term affect grantees? Find out in our recent research.